Houghton Library is pleased to announce two important new acquisitions associated with the iconic children’s book character Babar the elephant. 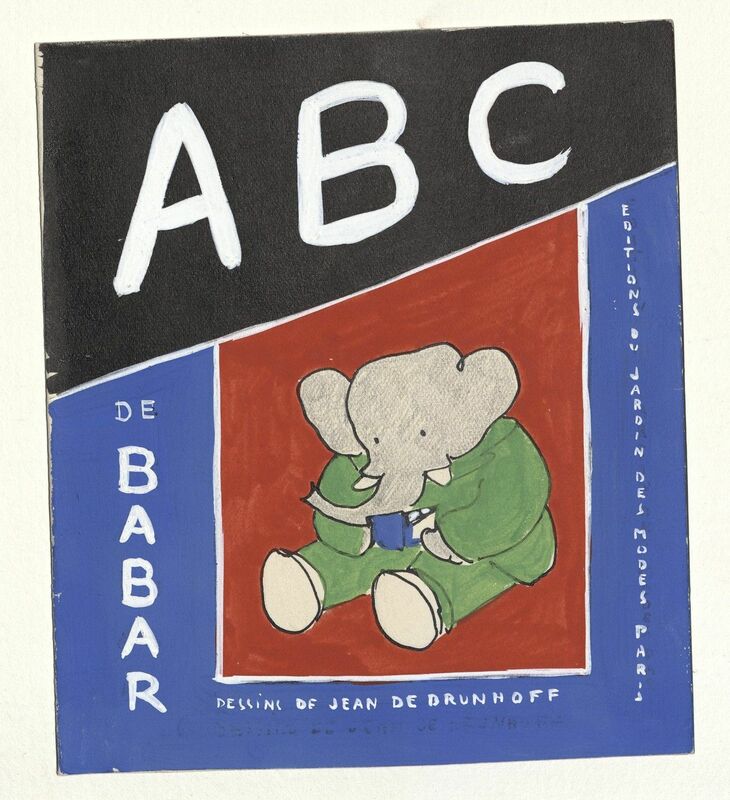 The first of these, thanks to a generous gift from Laurent de Brunhoff and his wife Phyllis Rose, is the complete archive of preparatory materials for the book ABC de Babar by Jean de Brunhoff, Laurent’s father. The series of Babar stories began in 1931 with the publication of Histoire de Babar (The Story of Babar, the Little Elephant), a picture book by Jean de Brunhoff based on a bedtime story told by his wife. This was followed by Le voyage de Babar (The Travels of Babar), Le roi Babar (Babar the King), and in 1934 by the ABC de Babar (Babar’s ABC). All in all Jean de Brunhoff produced seven Babar books, of which the ABC de Babar was the fourth. In 1946 Laurent de Brunhoff continued the series begun by his father and since then has published more than thirty additional titles. 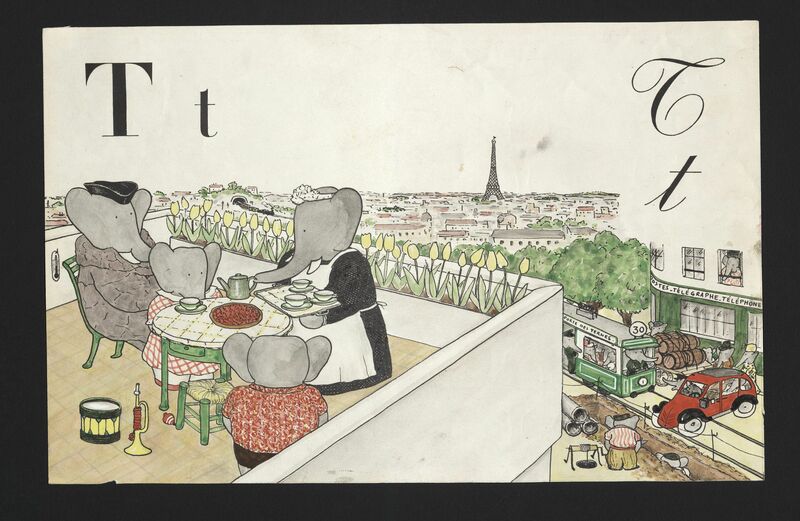 The ABC de Babar differs from the story books that came before it in that it is an alphabet book in which Jean placed characters from the Babar stories and other elephants in scenes filled with objects and activities that represent each letter of the alphabet. French children were encouraged to learn their letters and improve their vocabularies by picking out and naming as many objects as they could whose names begin with the letter in question. The archive of preparatory materials includes the original manuscript and the original illustrations written and drawn by Jean. It documents every stage of the creation and production of the book, starting with the first graphite sketches of animals and a small mock-up book that shows Jean trying combinations of letters and pictures. Finished ink drawings for the better part of two alphabets show him still experimenting with the composition of scenes and the layout of the book. Many of these are quite different from the published pictures. Once Jean had decided on the final illustration for each letter he made drawings in black ink. These were sent to the printer, who photographed them and used them to print proofs of the black outlines. A set of the proofs was returned to Jean, who colored them by hand and sent them back to the printer, who photographed them in color in order to create the color separations needed for printing the book. The archive is a remarkable witness to Jean’s imagination and artistic talent. It is also of significance in that it shows how a commercially successful children’s book was created and produced in the first half of the twentieth century. The choice of the ABC de Babar as a gift to the Printing and Graphic Arts Collection at Houghton Library is particularly appropriate, since this collection was formed for the purpose of documenting the history of book illustration and book production. From its beginning, in 1938, it has included children’s books, alphabet books, and drawings for book illustration, including drawings for children’s books. The second new acquisition is an original watercolor by Laurent de Brunhoff, commissioned by the library to celebrate the acquisition of the archive. In January 2016, as the gift transaction was being finalized and a Babar exhibition planned, Harvard Magazine took note of the fact that in 1965, when Laurent de Brunhoff published Babar Comes to America, he included descriptions – and depictions – of Babar visiting Harvard University, chatting with students in Harvard Yard, receiving an honorary doctorate, relaxing at the Harvard Lampoon, and attending the Harvard-Yale football game. This suggested a train of thought: “Babar comes to America,” “Babar comes to Harvard,” Babar comes to Houghton.” The last phrase immediately became the title of the exhibition. 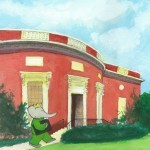 That in turn inspired a mental image of Babar coming to the library. Through Mary Ryan of Mary Ryan Gallery, who represents Laurent de Brunhoff, the library inquired whether he would accept a commission. 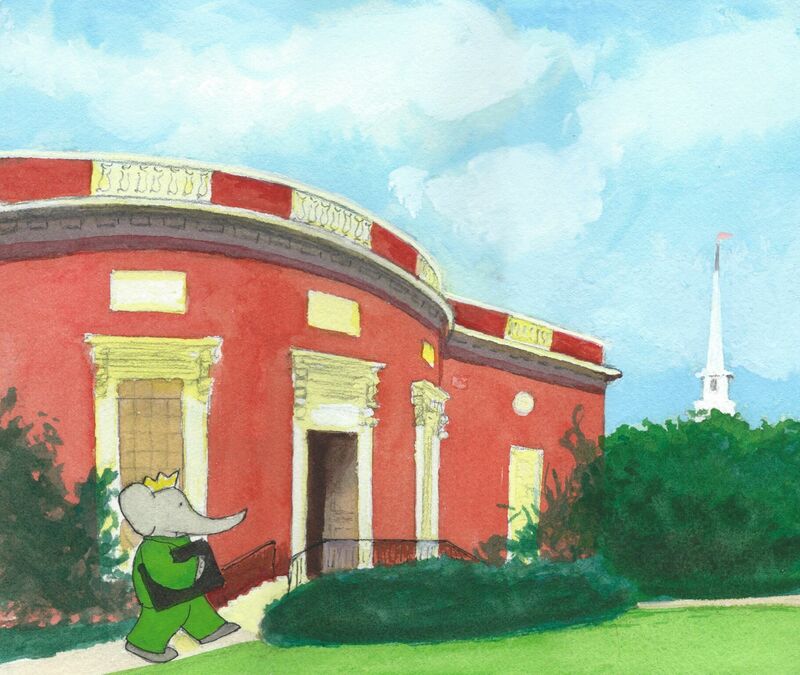 The answer was yes, and as a result the library now possesses a marvelous original drawing that depicts Babar mounting the steps of the Houghton Library building, carrying his ABC under his arm. 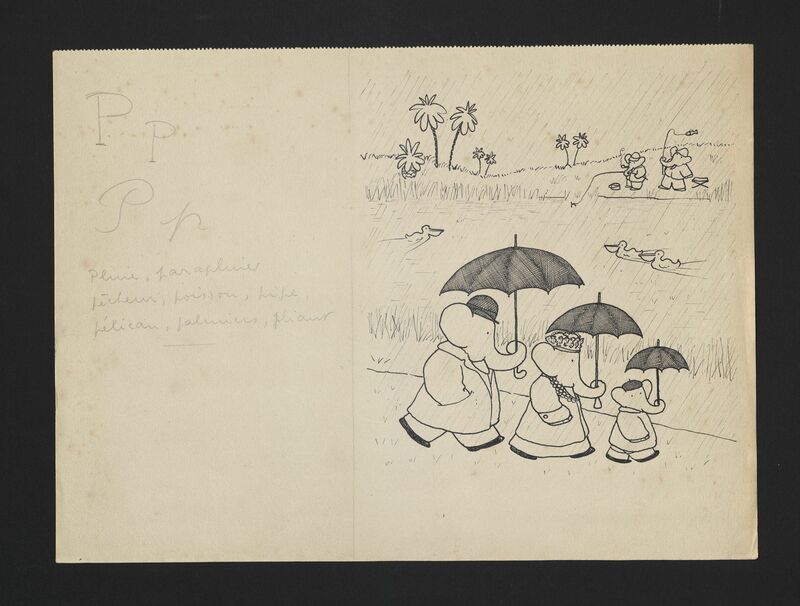 The exhibition Babar Comes to Houghton Library includes a selection of materials from the archive for the ABC de Babar as well as Laurent de Brunhoff’s drawing Babar Brings His ABC to Houghton Library. It is open until August 31 in the Amy Lowell Room at Houghton Library.